I first came across Giambattista Vico in reference to ecological thinking and the Scottish poet George Bruce. Through journals he kept during the early part of his academic life he intimated his intention to codify a set of universal or general laws or principles at some point in his career. This was done perhaps as an indicator of the scope of his ambitions. Until the relatively recent posthumous publication of Laws of Media in 1988 his methodology remained controversial and poorly understood by many as did his theories on media. The fullfilment of his ambitions is best exemplified by Laws of Media which first appeared as an article by McLuhan in 1975 and formed the basis of his last decade of collaborations with many including Barrington Nevitt (with whom he has co-authored Take Today: The Executive as Drop Out. Laws of Media as a book was completed by McLuhan’s son Eric, and published a decade after his death. After a decade-long search, Eric and Marshall McLuhan discovered that there are four such messages or characteristics that they posed as probes: What does the artefact extend, enhance, accelerate or enable? When extended beyond the limit of its potential, into what does it reverse? What does it obsolesce or cause to lose its dominance? What does it retrieve from the past that had been formerly obsolesced? Given that these can apply to all conceptions and creations of humankind, all human artefacts be they tangible or intangible are media. Using the four media laws allows us to find connections and ratios or analogues among things and ideas that are not obviously connected, thereby assisting us in becoming aware of the hidden ground. McLuhan called this four fold set of laws and figure ground relationship a “tetrad”. Some posit a fifth law based on McLuhans statement that much of his work is mennipean satire. Today’s audience would recognize this technique at it’s present coordinates at adbusters.com on the internet and represented in phenomena such as culture jamming. Below right is a graphical representation of a tetrad. The roots of McLuhan’s interpretation, and the laws of media, are deeply rooted in the past. They are traceable to the ancient Western curriculum, the trivium (logic, rhetoric, and grammar) a tradition which McLuhan re-discovered while preparing his doctoral thesis at Cambridge. In the Laws of Media, he linked these own discoveries to the work of Francis Bacon and Giambattista Vico. The project is centred on a site specific location which involves a local art centre (Cornerstone Didcot Oxfordshire), an abandoned railway track (now a public thoroughfare) and internet resources specifically GPS locative applications on handheld devices. I aim to draw together my multidisciplinary activities in one specific outcome. This will be an exhibition tied in with locative media that will involve public engagement in producing new artworks through GPS drawing. Users will use handheld internet connected devices to both read and create interaction during the event. I was recently asked to pen an Artist’s Statement and the following draws on that article. 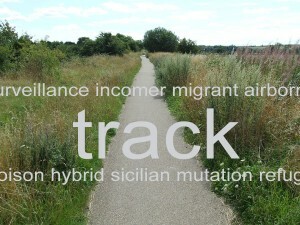 Using images of ‘migrant’ plant life found along a disused railway line in Oxfordshire over which I am superimposing sets of three words which reflect on not only the migrant plant histories but also reflect wider current concerns with displacement, nationality and sense of place. The Didcot to Newbury and Southampton railway line was axed by Beeching but carried freight until the late 1960’s and I remember it being in use as a small child. Indeed the track represents a key component of my own personal ‘psychogeography’ thus enabling a serious meditation on aspects of rural life, diaspora and the changing role and use of the english landscape. I hope to publish a very limited edition photograph and poetry volume containing not only the 12 ‘track’ images but also 12 ‘Downland ballads‘ which I am writing concurrently for the project. The poems are a part of the process reflecting on historical links and indeed ‘tracking’ aspects of my life and the history of this small and unremarkable part of the South Oxfordshire landscape that does not conform to ‘idealist’ notions of art and landscape. Should an application to the recently opened Cornerhouse Arts Centre in Didcot be successful I hope to display the entire series as a digital series and also present the documentation and original paintings which will grow out of this project. This is hopefully to be sometime in 2011/12. I am commencing a M.A. in multimedia through my own University. It open-ended and research based and will bring traditional practice and internet together. I aim to draw together my multidisciplinary activities in one specific outcome. This will be an exhibition tied in with locative media that may involve public engagement in producing new artworks through GPS drawing.